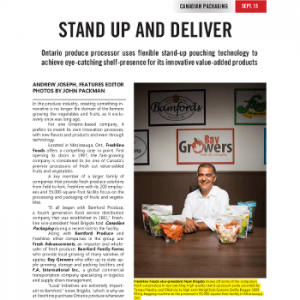 In the produce industry, creating something innovative is no longer the domain of the farmers growing the vegetables and fruits, as it exclusively once was long ago.For one Ontario-based company, it prefers to invent its own innovation processes,with new flavors and products and even through technology.Located in Mississauga, Ont., Freshline Foods offers a compelling case in point. First opening its doors in 1997, the fast-growing company is considered to be one of Canada’s premier processors of fresh cut value-added fruits and vegetables. Fresh Advancements, an importer and wholesaler of fresh produce; Bamford Family Farms who provide local growing of many varieties of apples; Bay Growers who offer up-to-date apple growing, storage and packing facilities; and F.A. International Inc., a global commercial transportation company specializing in logistics and supply chain management.